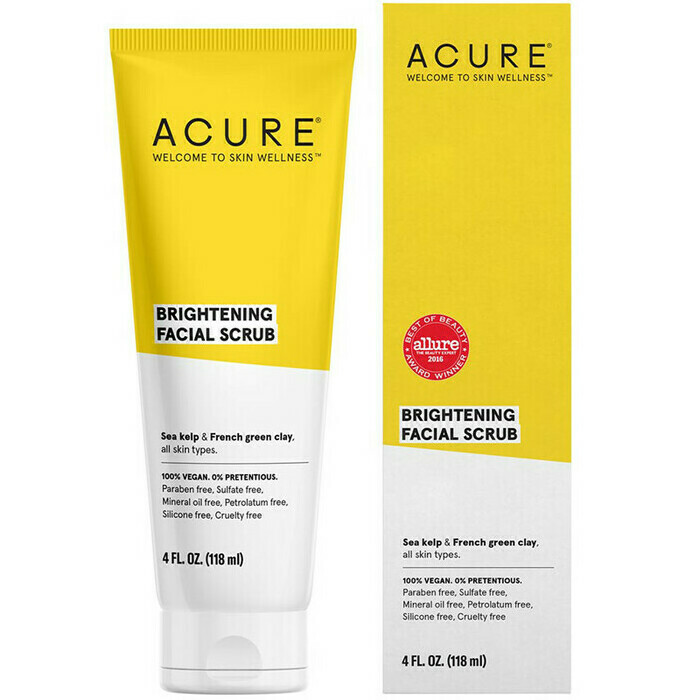 This Acure Brilliantly Brightening™ Facial Scrub is formulated to effectively lift and buff away dead skin cells and built-up dirt and grime, as it nourishes, hydrates and brightens all types of skin. 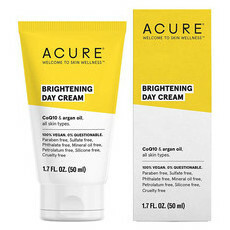 With gentle, lightly abrasive Walnut Shell Flour, French Green Clay and Lemon Peel Granules, this skin-reviving formula also contains active ingredients such as detoxifying Sea Kelp Powder and antioxidant-rich Acai and Pomegrante Fruit Extracts, which all work together with Madonna Lily Culture Extract to smooth, soften and revitalise your complexion. Especially beneficial for those with pigmentation, blackheads, dark spots or large pores, this Acure Brilliantly Brightening™ Facial Scrub has featured as a winner in the Allure.com Best of Beauty Awards in both 2015 & 2016. Made in the USA, GMO Free, Vegan, Gluten Free, Certified Cruelty Free. Packaged using soy-based inks and a minimum 70% recycled material. Acai Berry, Aloe Vera, Blackberry, Calendula, Chamomile, Pomegranate, Rooibos Tea, Spearmint, Vegetable Glycerin. Water/Eau, Aloe Barbadensis (Aloe Vera) Leaf Juice*, Euterpe Oleracea (Acai) Fruit Extract*, Rubus Fruticosus (Blackberry) Fruit Extract*, Rosa Canina (Rosehips) Fruit Extract*, Punica Granatum (Pomegranate) Fruit Extract*, Calendula Officinalis (Calendula) Flower Extract*, Matricaria Recutita (Chamomile) Flower Extract*, Aspalathus Linearis (Rooibos) Leaf Extract*, Vegetable Glycerin, Sodium Methyl Cocoyl Taurate, Juglans Reglia (Walnut Shell) Flour, Kaolin (French Green) Clay, Sodium Lauroamphoacetate, Sodium PCA, Sodium Lauroyl Lactylate, Citrus Limon (Lemon) Peel Granules, Glyceryl Laurate, Sodium Cocoyl Isethionate, Cellulose Gum, Glucono Delta Lactone, Chlorophyll, Chrondus Crispus Extract, Potassium Sorbate, Olea Europaea (Olive) Fruit Oil, Argania Spinosa (Argan) Culture Extract, Chlorella Vulgaris Extract, Salvia Officinalis (Sage) Leaf Extract, Mentha Spicata (Spearmint) Leaf Extract, Laminaria Digitata (Kelp) Powder, Lilium Candidum Leaf (Madonna Leaf) Culture Extract. 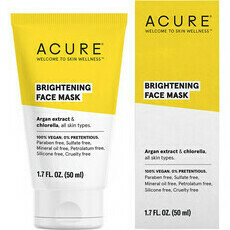 Apply small amount to wet face and gently scrub with your fingertips. Rinse thoroughly with water. Use 3 times per week for best results. 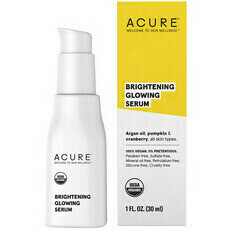 Follow with your favourite serum or moisturiser. This scrub did nothing for me except upset my sensitive skin and leave dry red patches on my face.. each to their own though! It definitely deserves an A+ for all its ingredients being legit non toxic and natural though! I think it’s worth trying it obviously works really well for some people! I received a 30 ml sample of this and I will be buying the full size when my current brand scrub runs out. This stuff is truly amazing. Sensational ingredients and just enough coarseness to feel it working without ripping your face off. I was surprised at how glowing and fresh my skin looked after just one use!